Autumn is my favourite time of year - so much so we’re going to get married in Autumn next year! Aaargh! As I write this though, there has been an unusual warm weather front so everyone has been baking today! Typical! Nevertheless I’m hoping it’s just a fluke and it will go back to crisp mornings and chilly evenings where it’s perfectly acceptable not to go out on an evening and instead hunker down under a blanket. Here are my tips for “cosying” up a space. My bed is one of my favourite places to be when the weather turns colder, I would go to bed as soon as it got dark if it was socially acceptable! 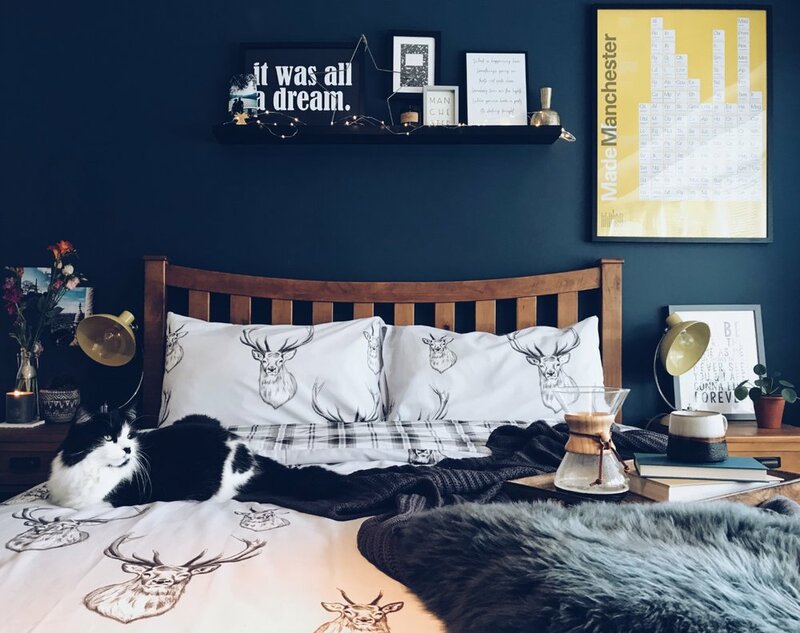 When Catherine Lansfield got in touch and asked me to try their Stag bedding, I jumped at the chance to cosy up the bedroom with this gorgeous duvet set. It’s also a great piece for Christmas if you like to update your decor at this time. I added a Catherine Lansfield charcoal chunky knit throw and a sheepskin rug to add extra texture to the room and make it look really warm and inviting. Of course fairylights also help! You can create your own little sanctuary where you can curl up with a good book and a massive mug of coffee, tea or hot chocolate - whatever floats your boat! Candles, candles, candles are the key here. Light them all and have them everywhere (obviously be really careful and never leave them unattended) but there’s nothing better than turn the “big light” off, switching on the lamp and lighting the candles. It creates a gorgeous cosy space with a lovely ambiance. Perfect for nights on the sofa under a blanket watching a film. Pumpkins. They are everywhere at this time of year. I’m not talking about the ones carved with triangles for eyes, although don’t get me wrong I love a good carving session - it brings back so many good childhood memories. But there are so many more amazing varieties out there these days that you can use them as a styling staple all through October. Create a gorgeous display in a fruit bowl or use them as props on shelves. The possibilities are endless. Shoutout to my favourite florist - The Flower Lounge for supplying me with the most beautiful mini white pumpkins. I’m just going to say one thing - Cake! Get baking, cooking, hosting dinner parties; whatever you can to spend time here all toasty whilst the weather rages outside. If cookings not your thing - there’s always deliveroo! You can’t escape it this year. It’s everywhere. I’ve always been a leopard print fan, Ben calls me the crazy leopard print lady. I once turned up to the airport wearing a leopard jumpsuit, leopard shoes and pulling a leopard suitcase. That’s what happens when I have to get up at the crack of dawn for an early flight!!! Anyways I digress - but I just wanted to share this gorgeous scarf from Accessorize and think it’s the perfect Autumn accessory. Have a lovely Autumn from me and Bojangles! Technically not Manchester but close enough and just 20 mins on the train. This place is absolutely gorgeous, every single detail has been thought of - from the floor to the stairways to the fabrics. Set in an old church, the high ceilings and arched windows are perfect for statement chandeliers and bold patterns. There's a sense of fun in the little touches - neon lights, colourful flowers and vintage propping that gives this space the edge. Probably one of Manchester most Instagrammed spots - the Winter Garden is everything you'd want it to be and has probably been the source of inspiration for a few of Manchester's latest spots. From the monochrome tiles on the floor to the deep green velvet sofas, I adore everything about this space. The tree in the middle wrapped in fairy lights is a real showstopper, and the marble table tops and floral patterns work so perfectly together. Set in the Palace hotel, you really feel the grandeur of the past whilst being completely in the now. This was an unintential find one day wandering around the Northern Quarter but definietly one I'm glad I stumbled one. Chapter One Books is an independant bookshop/coffee shop in such a lovely space, it makes you want to stay here for hours. The decor is so eclectic with random bits of furniture used to display books, chairs for lounging and the most gorgeous green vintage reading lamps I have seen in a long time! It feels like stumbling into someone's very eccentric lounge but immediately feeling at home! Nestled behind all the major tourist spots in Spinningfields, The Refinery sits quietly and unexpectedly. 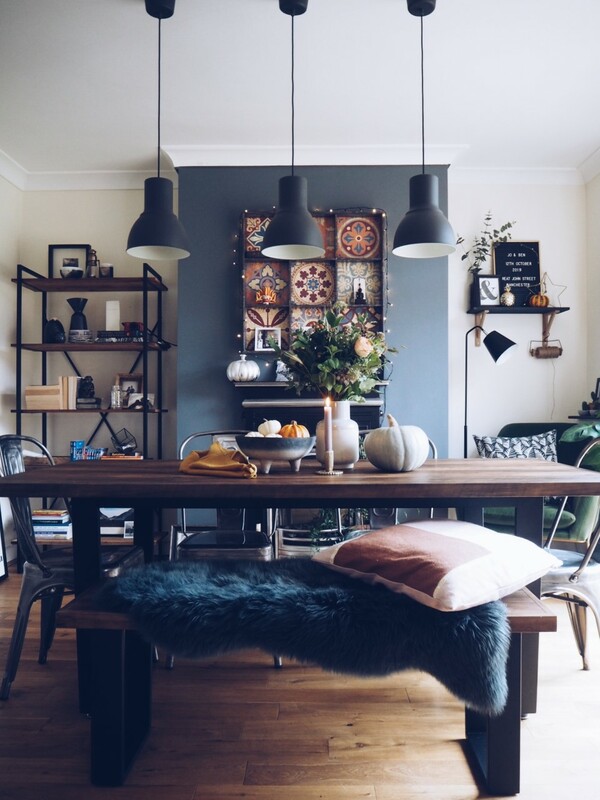 This is the ultimate "Hygge" and Scandi Chic spot in Manchester complete with fur throws and candles. The soft greys and warm yellows make this space the ultimate place for bottomless brunch with the girls or even somewhere you can take Mum and make her feel special. It also hasn't been tainted by the alchemist crowd so get there whilst it's still relatively unknown. Anywhere that offers blankets with a cocktail becomes my favourite place immediately. For all the old school colonial glamour, head to Grand Pacific. It is glam and grand, with high ceilings and parquet floors, peacock chairs and huge palms. It is the perfect escape to have a cocktail or two and soak in the surroundings. The toilets are also the stuff of dreams, starting my silly back & forth with a few fellow Instagrammers over great toilet designs. #ihavethisthingwithrestaurantloos may take off one day! This place is probably the most brand new of them all. It is everything that is on trend at the minute. I'm in love with the soft pinks and rose golds contrasting against the deep blues and black marbles. It screams luxury and you can tell the designers have really thought about creating an 'on trend' cool vibe. A newbie to Bridge Street, just off Deansgate - Randall & Aubin is the most stylish fish restaurant I have ever been in. Not only was the food delicious but the atmosphere was lovely. The space is very long and narrow with mainly big tables for groups and lots of sharing dishes, inviting you to get stuck in and really enjoy one another's company. There are a lot of patterned tiles everywhere with accents of brass to keep it classy. The toilets are something else too - pink, greens and that wallpaper is just amazing! So vibrant and fun yet also maintaining the level of luxury. The Wonder Inn is a magical place on the edge of the Northern Quarter, nestled in an derelict warehouse that Manchester is rich beyond belief with. It's a wellness centre dedicated to the community and houses a cafe, bar, yoga rooms and workshops. The low key styling of this space is just wonderful, who doesn't love fairy lights up against stripped walls with umbrellas hanging from the ceiling? The sense of history is fantastic with most of the original features remaining as well as peeling plaster and wonky ceilings! We stumbled on a Brass Band Gig here and it was absolutely epic. The pancakes here alone are enough reason to visit but the decor is pretty amazing too. It's very American Eatery but with a David Hockney colour palette and will brighten up your day immediately. You might have to queue to get in but it is 100% worth the wait. The zebra wallpaper in the bathrooms is also well worth a nosey. I can't resist a Zebra theme! As I am writing this, there's at least 1 new place popping up on my radar everyday. Leaving the possibility open for a version 2 of this post - and also plenty of opportunities for me to go wandering, drink and eat! The dining room has been a gradual process over a year and half, which although considering how impatient I normally am to have something finished, has worked out perfectly. I really feel like this room has evolved over time and will continue to evolve in the future as we grow. 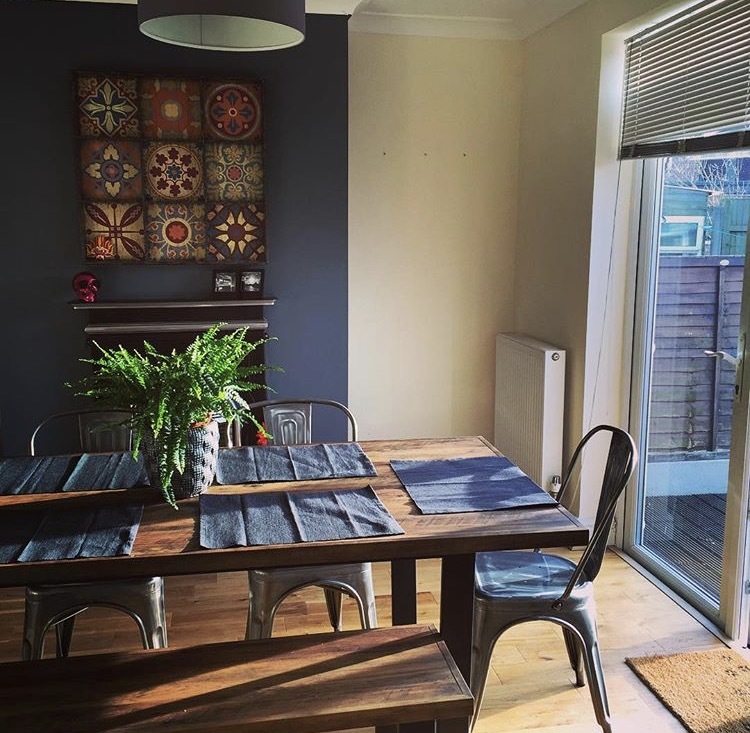 This was the space that sold the house to us, the open plan kitchen/dining space at the back of the building in which I immediately started imagining entertaining friends, having romantic meals and generally hanging out here. We live on a fairly busy road so this space is an escape and perfectly private. The romantic meals might be few and far between but the parties and fun are definitely not! The first thing we did was get rid of the red - the previous owners had a hankering for all things red and pink. I, on the other hand, am obsessed with grey! The room and kitchen were in pretty much brand new condition so I just went with painting the chimney breast. This is something which may change over time but it was quick fix for me to paint quickly myself. It's Valspar "Bottlenose Dolphin" which I think we got inspiration from spotting a grey paint feature in an interiors mag. We spent the first 2 months in this space on camping chairs with a coffee table whilst we waited for the sofas to be delivered and for the tv connection to be installed in the living room. Very glam! The Instagram favourite piece is the wall art above the fireplace which I bought whilst working as a Visual Merchandiser for BHS. It was such a bargain, we hadn't even found a house at this point but I couldn't resist it. The fairy lights were added for the housewarming as the OH isn't too keen on "girly things." At the time I was obsessed with an internet provider ad which showed a house party and Chaka Khan was playing, there were fairy lights everywhere, the house was filled with people and it just looked like the best party ever. That's what we tried to recreate and I maybe bias but it came pretty close! Once the lights were up, they never came down! Our table and bench set is from Next - I had a very clear vision from the start in terms of a dining table and this fit perfectly. We ordered the chairs from eBay which I was terrified of doing but it turned out to be the most seamless transaction I've ever done! It became very apparent we were creating an industrial look without thinking too much about it, but the dark woods and the metal legs became a running theme. The pendants are good old IKEA and we had to wait a while for an electrician to fit them but they were absolutely worth the wait. The OH sourced the bookshelf as we struggled for ages to find something which would fit in the alcove and with our interior vision. In the end we found it on Maison Du Monde. The next big purchase was the sideboard which is rarely seen in my Instagram posts, partly due to my struggling orange tree and partly due to it always being hidden from the camera as it's tucked behind a return wall. It's from made.com and is definitely a work in progress. The final piece of the puzzle came from the infamous green velvet chair from made.com. After Pantone announced their colour of the year 2017 - Greenery, my day job meant I was surrounded by all things green and I wanted to inject some of this into our room. We waited the longest time I've ever waited for something - I think it took 5 months. But once it arrived, the whole area was dreamt up in a day. All artwork and photographs are a result of my love of trawling craft fairs and makers markets and finding pieces that resonate with us and our life. I also like to think of myself as an amateur photographer so there's also loads of pictures I've taken of Manchester and the North West dotted around. This space is still our favourite room in the house and we've managed to create exactly what we imagined when first viewing it all the way back in November 2015. It will no doubt see more changes as my day job dictates I can't stop faffing and I can't wait for more dancing on the chairs with cocktails in hand to easy 90's with all our friends.